Our Industry’s most innovative and leading ITAD program covers, Data, Destruction Services, Secure Chain of Custody, Detail Reporting, Data Destruction Certificate, and EPA complaint recycling. What distinguish our ITAD Program from our competitors is our leadership’s focus on minimizing associated program cost and maximizing our customer’s recovery values, by leveraging our unmatched global resale arm that our team has developed over thirteen years. Our diverse team has experience in selling to forty two countries and they have their fingers on market pulse. Spruce IT’s ITAD re-marketing team is proud to have established trustful and friendly relationship with over fifteen thousand global buyers of surplus IT hardware. As you know, many serious liabilities are associated with your private company and client data. Therefore, we maintain strict adherence to the mandates set forth by the NIST, U.S. Department of Defense and other agencies concerning the destruction of embedded. 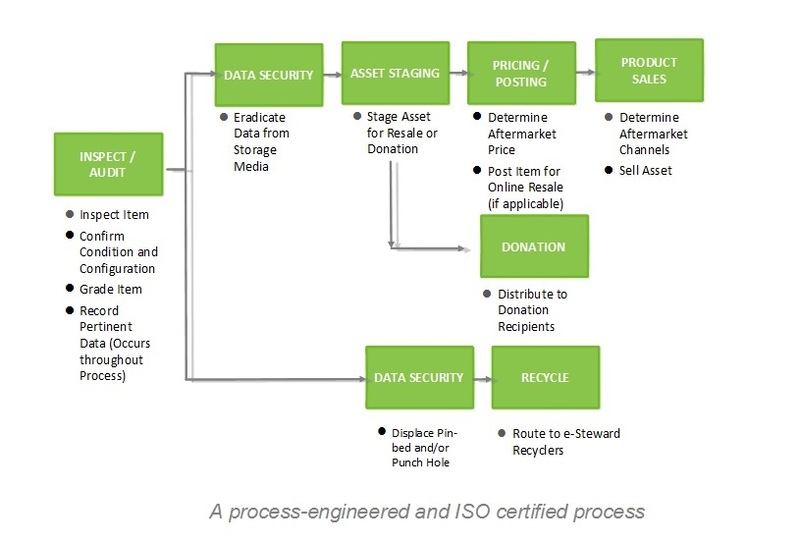 Data Eradication is the preferred choice of data destruction, as it enables re-deployment and resale. However, the technical reality is that today’s market standard (U.S. Dept of Defense 5220.22-M) is a software overwrite protocol developed over 20 years ago and’s ill-equipped to eradicate data from traditional spinning-disk technology of size (500GB+) and simply unable to certifiably eradicate data from solid state technology. To solve for this issue, we have expanded our suite to include a firmware-based protocol that can be up to 8x faster for select spinning disks (250GB+) and has “verifiably” eradicated select solid state technologies. And as compliance in several verticals prohibits transport of resident data, we provide this eradication service onsite. Our ‘Secure Erase’ protocol is performed inside data centers through the backplane of enterprise storage arrays and can eradicate over 700 HDDs simultaneously and is applicable to all types of HDDs including many Solid State technologies. Storage Media Shredding – Given the risk profile of select organizations, our suite also includes physical storage media destruction services. We understand that select organizations cannot physically release assets with any resident data, thus we offer these services onsite as well. Here, our service includes trucks with cameras and viewing booths for client witness of all destruction on your premises. Once packed, we coordinate shipment to the closest regional facility where each asset undergoes a comprehensive audit, data eradication, warehouse staging, then is resold or recycled. And Spruce IT provides detailed reporting throughout the process. Each asset received into our facility network undergoes a value-based Audit based upon it’s type, age, and condition, whereby we destroy data through eradication of valued HDDs and shred the balance of HDDs. Each asset is tested and we capture the serial number, model, configuration and condition of each asset. Please contact our ITAD Program Specialist to further assist you with your organization’s ITAD needs.